Triterpenoid saponins (particularly glycyrrhizin or glycyrrhizic acid) are the major active ingredients of glabra. The concentration of glycyrrhizin in the root is about 2-6% depending on the method of assay. This phytonutrient shows significant expectorant, demulcent, anti-inflammatory and anti-allergic properties, making licorice root a popular herbal treatment of asthma. Glycyrrhizin is also what gives licorice its sweetness, being a substance roughly 50 times sweeter than usual sugar. Glycyrrhizin has recently been proved to reduce dental plaque formation, thus preventing caries. Glycyrrhetinic acid, a pentacyclic triterpenoid derivative, is another compound with mild expectorant properties. Its main feature, however, is its anti-ulcer action. Flavonoids (flavanones, chalcones, and isoflavonoids), present in a concentration of about 1-1.5%. Flavonoids are often reported to have antioxidant, anti-inflammatory, and antibacterial properties. Phytosterols have a long-time proven cholesterol-lowering (anti-atherogenic) effect. Some studies also indicate these compounds may increase estrogen levels to a certain extent. Licorice root is most often used as an expectorant, helping to break up the mucus present in the lungs and upper respiratory tract to effectively expel it via a productive cough. Some of the licorice’s flavonoids show potent expectorant activity after just three days of treatment. As such, different preparations of this plant are popular natural remedies for such conditions as laryngitis and pharyngitis, tracheitis, bronchitis, along with almost any other illness accompanied by a cough. Licorice root’s mild demulcent and anti-inflammatory properties are additional benefits for the described medical conditions. Some of the flavonoids present in this plant also have anti-tussive properties, decreasing cough frequency by up to 80% in animal models. This triple-effect (decrease cough frequency, increase cough productivity, and alleviate local inflammation) is what makes licorice root such a fabulous remedy for all kinds of respiratory infections. Anti-acne properties: Licorice root extract shows significant anti-bacterial action against Propionibacterium acnes, one of the major causes of acne. What’s also interesting is that treatment with glabra does not lead to the development of topical resistance of germs, contrary to what often happens after treatment with conventional antibiotics used for the treatment of acne. Asthma and allergies: The flavonoids present in licorice root extracts (particularly liquiritigenin, isoliquiritigenin, and dihydroxyflavone) could be a great support for those suffering from bronchial asthma and even such conditions as allergic rhinitis and other allergies as well. Blood cholesterol levels: Licorice root extracts are known to reduce total cholesterol, low-density lipoprotein, and triglyceride levels, most likely due to its significant antioxidative properties and ability to alleviate oxidative damage to the endothelium. Cancer: Although further studies are needed, there’s a lot of positive data pointing that licorice compounds show significant anti-tumor activity against prostate, colon, and breast cancer. In some cases, this is done by modulating hormonal activity and hormone receptors, in other cases this is a result of enzyme-signaling modulation, but the outcome is still the same: inhibited tumor growth. NOTE: It is important to NEVER take licorice together with cisplatin, a widely used chemotherapeutic agent, as this increases kidney damage. Dental plaque and caries: For instance, both water and alcohol extracts (although the latter works better) of licorice root have shown fabulous inhibiting effects against Streptococcus Mutans and Lactobacillus Acidophilus, two germs that are strongly linked to dental plaque. This effect is attributed to glycyrrhizin and glycyrrhetinic acid. Helicobacter pylori: Helicobacter pylori is a germ believed to be one of the major causes of peptic ulcer. 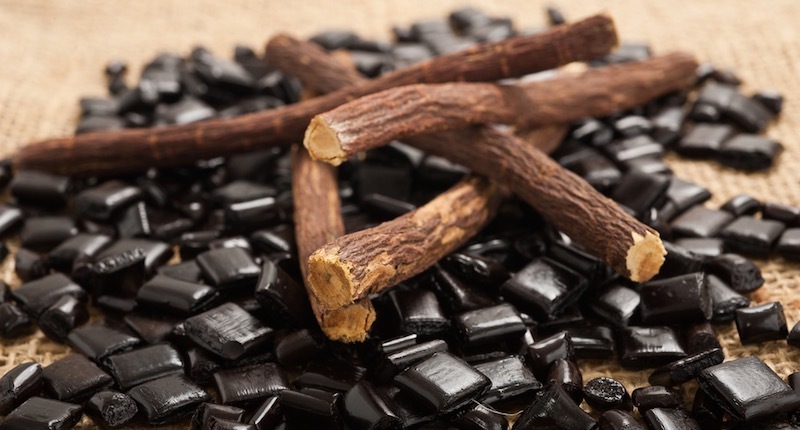 Glabridin, one of the main flavonoids of licorice, is able to effectively inhibit this bacterium, thus making licorice root a powerful remedy for bacterial gastritis and peptic ulcer. Liver health: Licorice root has been used in traditional medicinal practices for centuries, to treat liver ailments. Glycyrrhizic acid and liquiritin (one of licorice’s main flavonoids) show powerful hepatoprotective features against such conditions as fatty liver disease, hepatitis C, and liver damage. Peptic ulcers: Conventional treatment of peptic ulcers using antibiotics along with antacids have been known to cause perforation of the stomach lining which leads to bleeding and infection. Ingesting licorice root extract stimulates the release of a natural substance called secretin, that protects your stomach’s mucus lining, allowing the ulcer to heal. Post-operative sore throat (POST): POST is an extremely unpleasant condition affecting patients who undergo general anesthesia with tracheal intubation. A licorice gargle (30 ml water, 0.5 g licorice) performed 5 minutes before anesthesia is quite effective in reducing the incidence and alleviating the severity of POST. Most likely, this is the result of licorice’s demulcent and anti-inflammatory action on the mucous membrane of the throat and trachea. Subcutaneous fat: Glycyrrhetinic acid, one of the active components of licorice root, is able to block 11-beta-hydroxysteroid dehydrogenase type 1, an enzyme that regulates cortisol action on the distribution and deposition of fat. A study which included 18 healthy women aged 20-33 years has shown a significant drop in superficial fat layer thickness after one month of topical application of a 2.5% glycyrrhetinic acid cream with no side effects whatsoever. If using licorice root therapeutically, it is important to use either the dried root in powder form or its extract as a supplement. Many “licorice” products don’t actually contain licorice, so be sure that you buy from reputable companies, and read reviews of users who have found the product to be beneficial. Deglycyrrhizinated Licorice Root (DGL): Glycyrrhizin in licorice root is naturally sweet and completely safe for ingestion in small, infrequent amounts. However, if taking licorice root as a long-term supplement, make sure to choose a deglycyrrhizinated (DGL) supplement. It is recommended to chew on a DGL tablet just before a meal to help improve digestion and prevent acid refluxes. Tea bags: Drink one or two cups of licorice root tea each day to strengthen your adrenal functions, and increase your energy levels. Steep a licorice root tea bag in boiling hot water for about 5-10 minutes and enjoy with a little honey, if desired. Powder: If you have a sore throat, empty out the licorice root powder from one or two capsules into a glass of water and drink it slowly, allowing the solution to soothe the throat. If there are ulcers in the mouth, use the same solution and swish it in the mouth to speed up the healing. Gel and lotions: Gel and lotions that contain licorice extract can be used for topical application on the skin several times a day. It helps to soothe irritation of rashes, eczema, psoriasis and other skin conditions. Licorice root is contraindicated during pregnancy. Although it should be generally safe in doses up to 3 grams per day, there are studies that highlighted that significant licorice root ingestion during pregnancy could be detrimental to a child’s developing brain. Eventually, this may result in cognitive and behavioral issues including impaired attention, rule-breaking, and aggression. Contraindicated in cases of hypokalemia (low blood potassium), renal insufficiency, cholestatic disorders, liver cirrhosis. Use with caution in cases of proven medical history of arterial hypertension. Do not take along with the following conventional medications: thiazide and loop diuretics, cardiac glycosides, spironolactone, amiloride, and any corticosteroids. The glycyrrhizin and glycyrrhetinic acid present in licorice root have prominent and well-known pseudoaldosterone effects when taken in large (over 50 g/day) doses for longer than 6 consecutive weeks. Symptoms include elevated blood pressure, low blood potassium (hypokalemia), sodium retention, water retention, edemas, decreased urine output, low plasma renin activity, low serum aldosterone levels. In rare cases, licorice root toxicity may lead to myoglobinuria and myopathy—muscle pain and weakness due to muscular destruction. To reduce the risk of side effects and toxicity, one should take deglycyrrhizinated licorice (DGL), which is licorice without glycyrrhizin. It offers most of the plant’s usual health benefits without the risks that glycyrrhizin imposes. If licorice root is taken in doses under 50 grams/day and for periods shorter than 6 consecutive weeks, no side effects should be feared in the vast majority of cases. As a rule, licorice is tolerated fairly well.